When you go to MEPS (Military Entrance Processing Station) or your DoDMERB (The Department of Defense Medical Examination Review Board) to get medically screened for service as an enlisted member of an officer in the military, you will be fully examined from head to toe. Your vision, hearing, blood pressure, blood work, and even your teeth and much more will be fully screened to see if you have any medically related issue that prevents you from being able to fulfill your time of service. The disqualifying medical conditions of the mouth and jaw are listed below. The International Classification of Disease (ICD) codes are listed in parentheses following each standard. The causes for rejection for appointment, enlistment, and induction (without an approved waiver) are an authenticated history of the following issues. If you had any disease in the mouth area that now prohibits you from chewing or swallowing will be disqualifying. Current diseases of the jaws or associated tissues that prevent normal functioning are disqualifying. Those diseases include, but are not limited to temporomandibular disorders (524.6) and/or myofascial pain that has not been corrected. If you had any congenital or another injury that now prohibits you from chewing normally and cannot be surgically repaired, that will be disqualifying. You will have to get the surgery before you enter the service this apply for a waiver to enter the service, but as long as the chewing issue is corrected and is a procedure that you can request a waiver, then the chances of entering service are increased. Current severe malocclusion (524), which interferes with normal mastication or requires early and protracted treatment, or a relationship between the mandible and maxilla that prevents satisfactory future prosthodontic replacement is disqualifying. If you had any disease or injury that caused the removal of adult teeth and now prohibits you from chewing normal food will be disqualifying. If dental implants are used to correct the missing teeth, the procedure to correct will be reviewed by the military medical profession to make certain there are no potential complications in future use. If the procedure is approved and no issues reported then a waiver may be submitted. Approval for that waiver will be pending a medical review board. Current insufficient natural healthy teeth (521) or lack of a serviceable prosthesis that prevents adequate incision and mastication of a normal diet and/or includes complex (multiple fixtures) dental implant systems with associated complications are disqualifying. Cavities in the teeth that have been filled or will be filled will not be disqualifying. However, you cannot be sworn in unless all cavities or other dental repairs are treated. 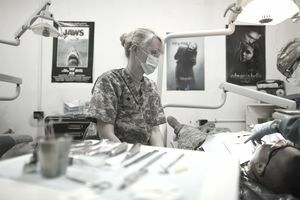 Individuals undergoing endodontic care are acceptable for entry in the Delayed Entry Program only if a civilian or military provider provides documentation that active endodontic treatment will be completed prior to being sworn into active duty. If you have braces on your teeth and still undergoing treatment from an orthodontist, you will not be allowed to join the military. If you have braces, you can still join the Delayed Entry Program but until the removal of the braces/orthodontic fixtures, you cannot be sworn into the military. Current orthodontic appliances for continued treatment (V53.4) are disqualifying. Retainer appliances are permissible, provided all active orthodontic treatment has been satisfactorily completed. Individuals undergoing orthodontic care are acceptable for enlistment in the Delayed Entry Program only if a civilian or military orthodontist provides documentation that active orthodontic treatment will be completed prior to being sworn into active duty. Derived from Department of Defense (DOD) Directive 6130.3, "Physical Standards for Appointment, Enlistment, and Induction," and DOD Instruction 6130.4, "Criteria and Procedure Requirements for Physical Standards for Appointment, Enlistment, or Induction in the Armed Forces." Do You Have to Be a US Citizen to Join the Military?